I bought a HDD last week and i made a short tutorial to install a internal hard drive disk. Push on the SATA connecter, if the HDD is connected properly the box will recognize it (the buttons in front will briefly light up), ,then take the box and plug it using the usb3 slave to its pc/mac. It should be seen as external support. If the new disks appear as not initialized, Open Disk Management: Control Panel -> Administrative Tools -> Computer Management -> Disk Management, Right-click the Disk Number (unknown) and select “Initialize Disk.”, choose GPT. you transfer the files if needed. You can then reconnect the box to your audio/video system. Personally i use a Sony 64GB USB Flash Drive (it is small and easy to handle) to transfer movies on Q10 pro’s internal HDD. But you can to used SAMBA, External portable hard drive or directly connect the Q10 pro on the PC/MAC. here's a video that shows how to transfer movies on the internal HDD with USB 3 Key. as i said above, i use a Sony 64GB USB 3 Flash Drive (it is small and easy to handle) to transfer movies on Q10 pro’s internal HDD, and all actions ( copy,delete, etc...) are done with the button Menu. It shows how easy it is to install and format. The Q10 Pro acts just like any standard external USB drive when plugged directly into a PC with a stock USB 3.0 cable in the back. This will make bulk copying of movies and music to the internal hard drive via USB quick and very easy!! Partitioning and formatting a 4Tb NTFS drive under GPT 4k (which a lot of media players and TV's will not read) was simple using Windows 10. I turned the power on the Q10 Pro after installing the drive and it was found by Windows easily. Finding the internal hard drive using "Media Center" is easy as shown above by #Olivier. (This is the default name of my Q10 Pro found under Windows). You can then use a PC to perform normal file functions on the drive (copy, delete, rename etc). I have noticed that copying over LAN is much slower (6MB/s) than copying to my Seagate Central (34MB/s) on the same LAN switch as the Q10 Pro. When plugged directly into the PC, the Q10 Pro copies large files much faster (at around 90MB/s). No matter what i do, my new Q10 Pro does not see the internal HDD - but my pc does. It is a Samsung HD155UI (1,5 TB). My pc sees it without problems as an external drive when it is in the Q10 Pro, but the box itself does not. The front panel also does not flash twice when inserting it. It tried both formatting guides i found here. Since your PC sees it as "Drive G:" does this mean you already partitioned and formatted the drive before putting it inside the Q10 Pro? It is easier to plug the Q10 Pro into your PC first and make sure it is working as a normal external drive. Refomat to NTFS if not already done? Disconnect from your PC and connect back to the TV with HDMI cable and Media Center should then show up the new Hard Drive as per the tutorial above? then i tried formatting it while it was in the Q10 Pro... the result is always the same. and my pc will recognize it just fine, but Q10 Pro itself won't. Tested many things for HDD but never formatted a HDD when inside a player via the USB-host port. Tested fast copying with all Windows flavors though. What I know for sure is that NTFS drivers used for Android are simplified versions not supporting all variants/options possible valid and handled by Windows 8/10 OS. So the drive being recognized by a PC via USB3-Host port and not by Android is possible. 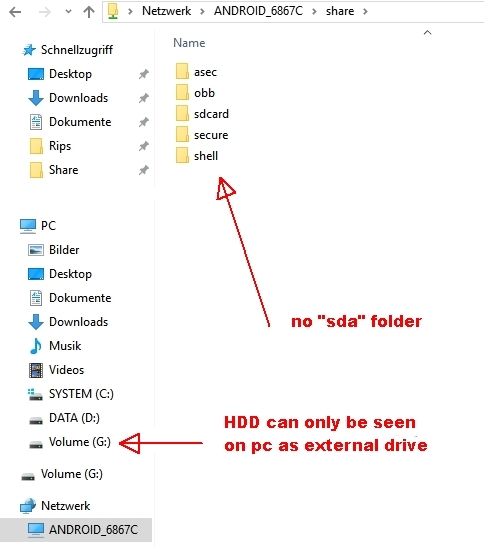 A method which always worked was connecting the drive (meant for Internal deployment) via (E)SATA to a Windows 8/10 PC and formatting is MBR/NTFS or GPT/NTFS . If still giving problems do the show command documented in my tutorial. I remember having formatted a RAID as external drive in Windows several years ago, but if you have done the same then something has gone wrong. You're supposed to connect it to the internal SATA connection of the PC, partition it using disk management and then format it normally. There should be no mentioning of formatting as an external drive. Doing that creates some kind of special partition which the Q10 probably won't understand. Try connecting it and recreate the partition in the disk manager. Just formatting again won't change anything. That was it - the HDD had to formatted while being connected via SATA to a Windows PC. Now the Q10 Pro also sees it. I was ready to give up and buy a new hard drive, so thank you very much! Don't know where to place this. But was looking for a quiet, reliable, low power HDD (for power requirements on Q10 Pro) and I thought WD Red 8tb WD80EFZX would pay the bill. And IT DID! Formatted first in my PC in GPT/NTFS and copied all my Music and Videos and then inserted it on my Q10 Pro. No hitch. 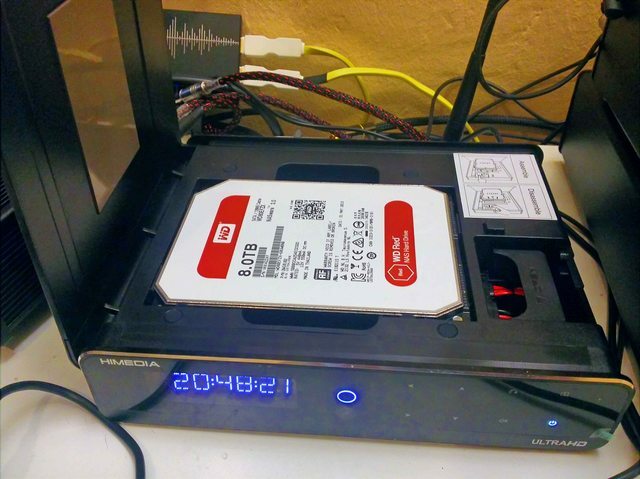 The WD80EFZX is a nice HDD, but above my budget. Using a Seagate a 8TB Archive instead. That one also does its job. Regarding performance and heat/power that does not make a difference when used for a media player. The WD should be more reliable. Have installed a used HDD and formatted as per instructions. I have transfer files well over 100 Mbps, very Happy using the usb3 cable. The 5M cable can go through the wall reaching the Hi Media connected to the TV and would love to keep this great speed transfer , but once the USB 3 cable is connected to the Media Player, I can no longer read the internal HHD through the media centre. When cable is disconnected everything works perfectly.